Fully furnished Vintage Mid-Century with amazing views, privacy, and outdoor space. Long driveway passes a private grass lawn and leads to the entrance where you are greeted by a mix of polished concrete and wood floors. Lower floor contains two bedrooms and one redone bath, a spacious family room with fireplace and access to the backyard, plus an office. 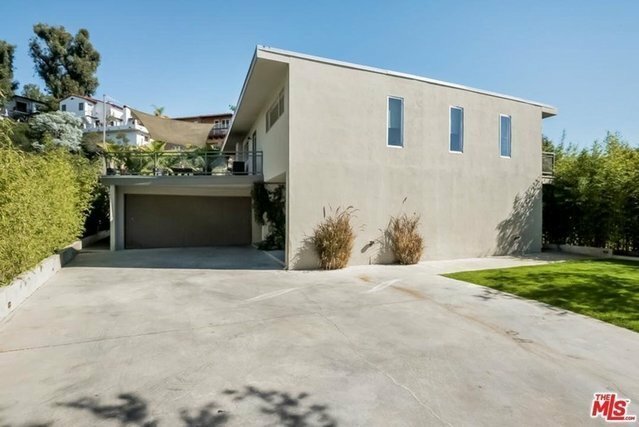 Upstairs is a dramatic, open kitchen with 6 burner Wolf range and stainless steel appliances and countertops, plus head on views of the Hollywood sign on one side and city views on the other. A huge, sunlit patio is accessed from the kitchen and dining area. The spacious living room opens to a balcony with gorgeous city views. This floor is also highlighted by an ultra chic master suite with skylit bath. Linen and cooking utensils provided. Just bring your toothbrush and a smile. Former home of Jazz great Stan Kenton.